A New and Accurate Map of Sweden. 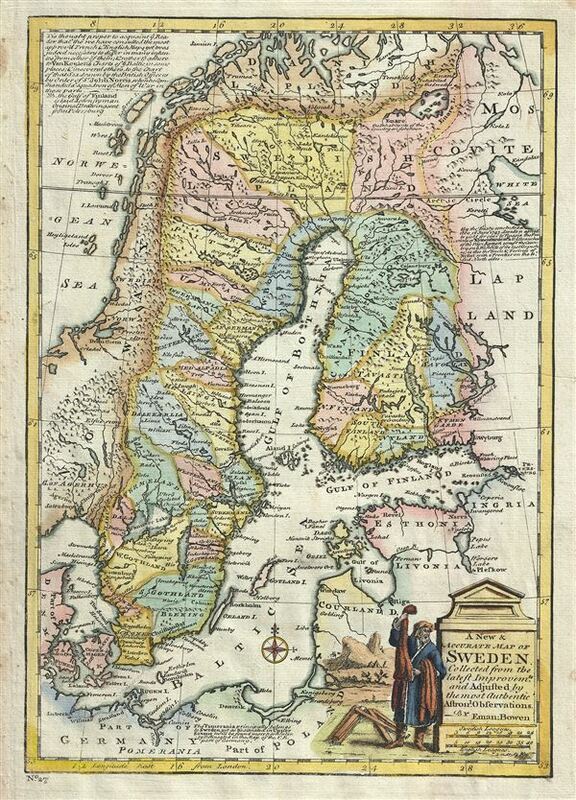 This is an attractive 1747 map of Sweden by the British cartographer Emanuel Bowen. It covers Sweden and Finland (shown as part of Sweden) as well as parts of modern day Estonia, Latvia, Denmark and Poland. It notes several important towns, cities, rivers, roads and other topographic features. The map is color coded according to provinces and mountains are beautifully rendered in profile. The map makes reference to the Treaty of Abo or the Treaty of Turku, a peace treaty between Sweden and the Russian Empire following the Russo-Swedish war of 1743, in which Sweden ceded the province of Kymengard and the fortress of Nyslot to Russia. The amp also includes a beautifully illustrated title cartouche in the lower right quadrant. This map was prepared by Emanuel Bowen as plate no. 27 for the 1747 issue of A Complete System of Geography. Rumsey 3733.026. Philips (atlases) 614 (1752 edition).